If you’re lucky enough to enjoy the company of cats, you know that they purr a lot. There is nothing better than a contented cat curled up on your lap, purring away happily while being petted by you, an equally contented owner. Many people think that cats purr just because they are happy. However, you may be surprised to learn that not all purrs are created equal, and that cats may purr for different reasons. Ok, But First Things First – Exactly How Does a Cat Purr? A cat’s purr originates in the cat’s brain. The brain sends neurological messages to the muscles of the larynx (voice box) that causes them to twitch at a rapid rate – 25-150 vibrations per second. Then, as the cat breathes, the vocal cords separate and create the purring noise. Every cat has a unique purr sound – some purrs have a high pitch, while others are just a low rumbling. Some purrs are so very faint you can hardly hear them, while champion purrers sound like miniature engines. Here’s a fun video you might like to watch on how cats purr. So, Why do Cats Purr? The act of purring releases endorphins within the cat’s brain. Endorphins are hormones that cause feelings of happiness, motivation, social connection, and more. With that said, cats purr for several reasons. Since they can’t speak, it’s not easy to pinpoint the exact cause for a cat purring at any given moment in time. If you want to try deciphering the reason for the purring, try thinking back to what was happening when the purring began. Here are some reasons why cats purr. Purring is often used as a form of communication. Your cat may be purring because he’s trying to tell you he’s hungry and would like some favorite kibble please. This solicitation purr might even be combined with a meow. Cat mothers will purr to communicate with their kittens who are born blind. In turn, at just two days old, kittens learn how to purr in order to communicate their presence to their mother and to encourage her to feed them. Thus purring as communication stays with them throughout their lives. When stressed or anxious, cats will purr to calm their nerves and soothe themselves. 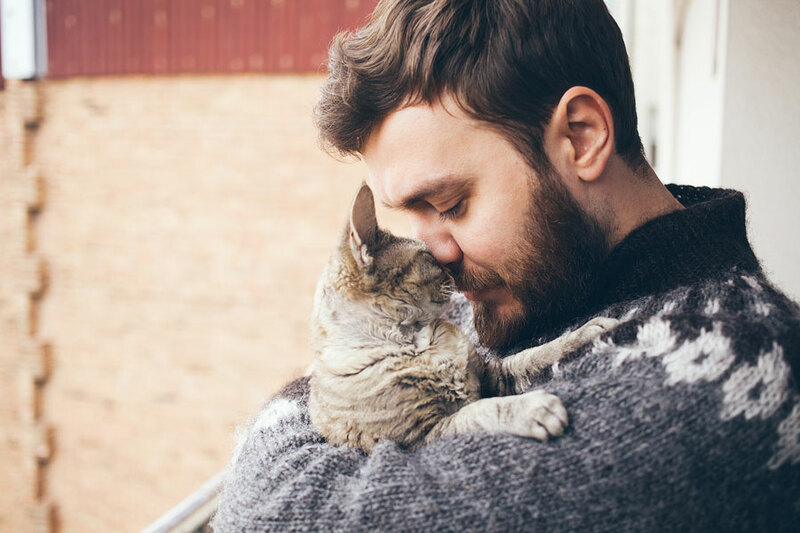 Because of the vibrations generated by the purr, purring can help reduce pain and inflammation, heal wounds, repair muscles and tendons, and even help stimulate bone healing. In case you find this hard to believe, purr frequencies correspond to vibrational/electrical frequencies used to treat certain conditions in humans such as bone fractures, pain, and wounds. In addition, a mother cat might well purr during the stressful event of giving birth. Pay more attention the next time your cat is purring, and maybe you can figure out the reason why. If your cat is purring or otherwise communicating because he’s injured and in pain, get him to a vet as soon as possible. If the injury needs emergency treatment and you live in or near Columbia, South Carolina, bring your cat to CVETS. We want your cat to purr because he’s pain-free and happy. Next PostMy Dog Eats Grass - Is it Safe?